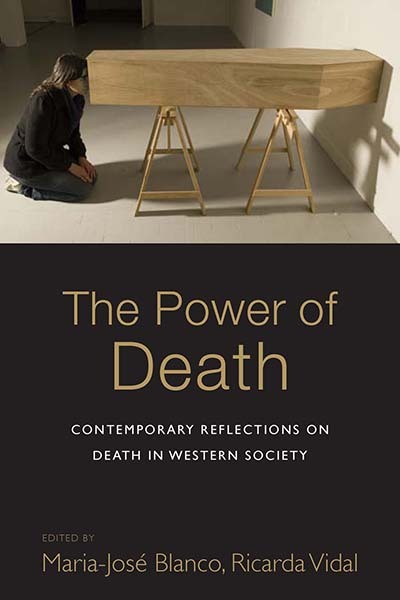 This is a guest post written by the authors of The Power of Death: Contemporary Reflections on Death in Western Society. Ricarda Vidal and Maria-José Blanco launched The Power of Death on May 15th, at the River Room, King’s Building, King’s College London. Below, the authors discuss the successful event. We were very happy about the large turnout for our Round Table on the Aesthetics of Death, film screening and book launch of our edited volume The Power of Death: Contemporary Reflections of Death in Western Society. The artist Sarah Sparkes started us off with a presentation about her work on ghosts and the world in-between life and death. Ricardo Gutierrez, a PhD candidate in the department of Spanish, Portuguese and Latin American Studies, gave a talk about femicide and the stylisation and sacralisation of the mothers of murdered women in Mexico. Photographer Briony Campbell closed with a very moving presentation about her work ‘The Dad Project’, which documented her father’s death by cancer. Ricarda Vidal and Maria-Jose then presented the book The Power of Death, which covers the various aspects of death – the slow painful death of cancer, the grief and mourning of those left behind, as well as the more sensational side of violent death, sudden accidental death or the taboos and transgressions of murder. The evening closed with a series of short films which ranged from the black humour of a spoof advertisement for a completely automatic Harakiri-kit to a thought-provoking, albeit poetic, criticism of the American justice system. Anyone interested in buying the Harakiri-Kit or our book at a 50% discount, please get in touch with Ricarda Vidal (ricarda.vidal@kcl.ac.uk) or Maria-José Blanco (maria-jose.blanco@kcl.ac.uk).